CLEVELAND (AP) - A mentally disabled former drug dealer was convicted Monday in the arson deaths of eight children and a woman at a birthday sleepover. Antun Lewis, 27, had been charged with one federal count of arson in the deadliest fire in Cleveland history because the house where the victims died was rented with a federal subsidy. Lewis was seated in court Monday with his hands folded, and he blinked a few times when the verdict was read. Several women ran from the courtroom screaming and crying. Court deputies kept the victims' families and Lewis' family members away from each other. The prosecution built its case around a felon who recorded a jail conversation with Lewis, Marion Jackson, who said he had served as a lookout when the fire was set at the three-story home. Prosecutors said Lewis broke in the 99-year-old home and doused the first floor with gasoline, setting a ravaging fire that killed the children and the woman, who was the mother of some of them. Lewis, a small-time Cleveland drug dealer, told The Associated Press in an exchange of letters from prison in 2008 that he knew the victims and would never do anything to harm a child. "The people that know me know that I am crazy about kids and know that I am against anybody that is out to do any harm to a child," he wrote. 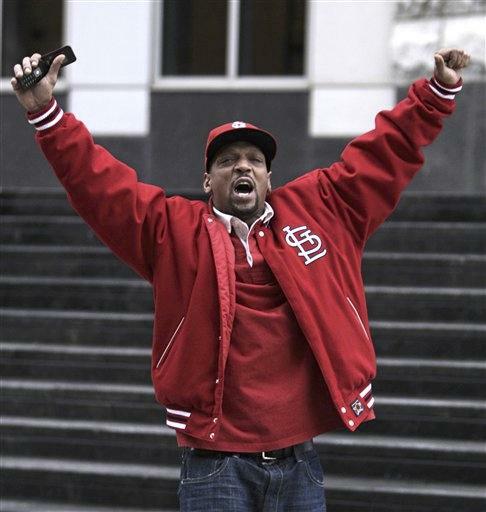 Miles Golden, the father of a 13-year-old boy killed in the fire, smiled broadly after the verdict was returned. "My biggest issue was he didn't get away with it," Golden said. "And we have some type of closure." Golden said he wasn't bothered by the judge's ruling that barred the death penalty. "To me," Golden said, "it doesn't matter if he stays alive (in prison)." Lewis faces a possible life prison term at his sentencing May. 10. Recellanese Campbell, who lost three cousins in the fire, said she was delighted. "I'm just glad that it's over," she said. "It was just a bad thing to lose all those kids." Angelo Lonardo, a member of the defense team, said Lewis hugged and thanked his attorneys. The conviction will be appealed, said defense attorneys, who highlighted the issue of the reliability of jailhouse snitches and a lie-detector test they said Lewis had passed but wasn't allowed as evidence. Defense attorney Wesley Dumas said the verdict was wrong. "I think the real killer is still out there," he said. "I really believe that. And with a set of facts like this, I don't think anybody in this community can really have closure about this incident." U.S. Attorney Steven Dettelbach, whose office led the prosecution, said the verdict had delivered justice. "Justice doesn't always come overnight, but justice came today with the jury's verdict," he said. Cleveland deputy police Chief Ed Tomba, who was in court for the verdict, said it was important to resolve the case for the families of victims. "It doesn't change the tragic events that took place, but they've been waiting, they've been waiting for justice for a long time," he said. The case had set the stage for a rare death penalty trial in federal court, but U.S. District Court Judge Solomon Oliver ruled out the death penalty in December. He cited defense evidence that Lewis has an IQ of about 70 or less, meaning he falls within the range of mild mental retardation. The fire killed 33-year-old Medeia Carter, four of her children and four other youngsters attending a sleepover marking Moses Williams Jr.'s 14th birthday. More than 4,000 people attended their funeral at a convention center. No motive was specified, but the prosecution suggested that Lewis was upset about a drug debt and wanted to get even. The defense repeatedly highlighted the absence of a motive, but the prosecution said it wasn't required to identify one. The jury began deliberating Friday afternoon in Lewis' case. It took the weekend off and finished deliberating Monday.